OTHER PLANS - THE NEW SHOW! 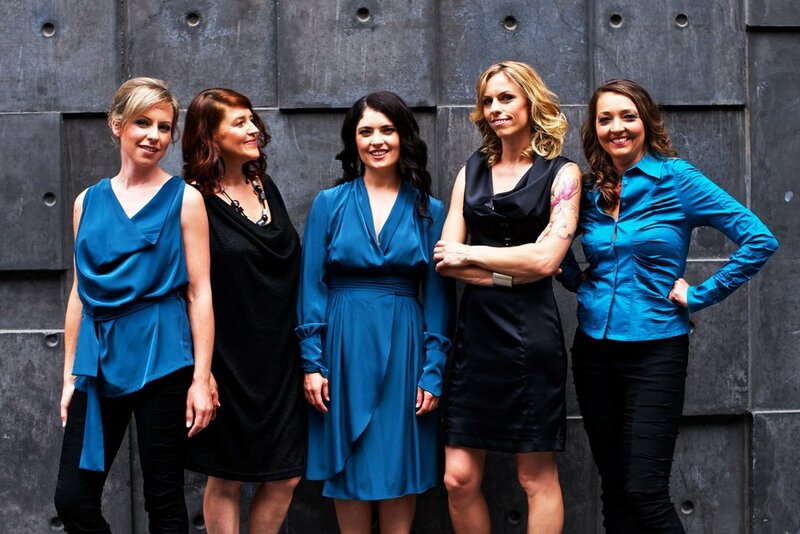 Coco's Lunch are Australia's award-winning, magical purveyors of original a cappella. Co-founded by Lisa Young and Sue Johnson in 1994, Coco's Lunch have released 7 albums to critical acclaim, performed at venues and festivals worldwide, received a host of awards and nominations, and continue to inspire, educate and compose innovative vocal repertoire for audiences around the globe. Coco's Lunch features Melbourne singer/songwriter/percussionists Nicola Eveleigh, Jacqueline Gawler, Lisa Young, Gabrielle MacGregor and Emma Gilmartin. It’s been hectic!!! Recording our new album (due for release at the end of 2019) and rehearsing up our new show for Four Winds Festival in Bermagui this weekend! We are so excited to bring our new songs to Bermagui and teach some brand new pieces in our Friday workshop. See you there!! 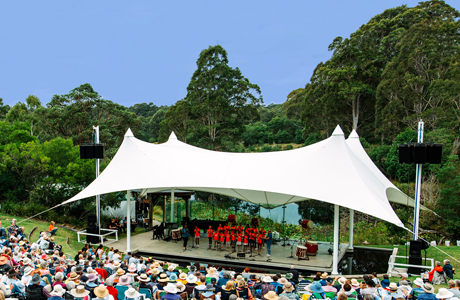 Coco’s Lunch is thrilled to be a part of the 2019 Four Winds Easter Festival in Bermagui over the Easter weekend - an amazing showcase of local and international artists in the exquisite natural setting of this beautiful coastal town. We’ll be conducting a singing workshop a well as performing in the magnificent Sound Shell on Easter Sunday in the Gala Concert. For more info head to our WHAT’S ON page. Getting our chops around Lisa’s fantastic tune in 7 ‘Misra Chappu’ in preparation for the recording of our brand new album, due to be released late 2019. Sign up to our mailing list to stay updated! We are sooooo thrilled to announce that our brand new video Other Plans has been nominated in the 2018 A Cappella Video Awards in the USA - one of 3 videos in the genre ‘Best Folk/World Video' and WE'RE UP AGAINST THE PENTATONIX!!! Winners announced in April - the question is whether or not to get our booties on a plane to L.A. for the awards!! Announcing the new music clip to our award-winning single Other Plans! Thank you to director César Rodrigues and the team at Blank Tape, Jamie Richardson for hair and Allira Taylor for make-up. Coco's Lunch artist Jacqueline and her partner Simon are elated to welcome their little lady Anaïs Kitty Rose into the world. Anaïs was born on 26 April at the Mercy Hospital in Melbourne and is already squawking up a storm with vocal folds that are alarming the neighborhood and showing great promise for audience participation in the Wally Wombat Shuffle. What a way to kick of 2017!! Today we were invited to perform at the Victorian Honour Roll of Women celebratory event to formally induct the 2017 inductees at Federation Square. An incredible morning and an honour to be surrounded by such amazing women! And the first gig to road test our brand new cozzies by gorgeous Melbourne label Dizingof. A most spectacular bunch of singers at our workshop at Singfest! What a beautiful sound they made, and what fantastic improvising we heard. Thank you for inspiring us, we can't wait to come back! Photo by director Brett Logan. NEXT WEEK!! (Are you coming??) Coco's Lunch is heading up to the Gold Coast from Fri 21st-Sun 23rd Oct to headline the SingFest A Cappella Vocal Harmony Festival!! Registrations are still open for individual singers, choirs and vocal ensembles to participate in competitions, workshops and concerts all weekend in the beautiful balmy Tweed Heads. Melbournians - It's not too late to kick off your winter woollies, pack some bikinis and and couple of tunes, and head north for an uplifting weekend of singing with like-minded A Cappella-goers! More Info here. Today we had the absolute pleasure of singing at Government House as part of the Governor's Performance Series, in partnership with Melbourne Recital Centre and Creative Victoria. What a stunning concert space and chance to perform for a hometown audience full of little people!! Thank you to everyone who came, dressed up, and filled the ballroom with voices!! Coco's Lunch Live (Family Show) at Government House!! Yes that's right, Coco's Lunch has been invited to perform a special 1 hour family show on Wed 28 Sept as part of the Governor's Performance Series in partnership with Melbourne Recital Centre and Creative Victoria. Register for FREE to be part of the audience for this special event, held in the gorgeous Ballroom at Melbourne's Government House. For children (pre-school & primary) and their parents, this concert has something for everyone! REGISTER HERE. NEW ARRIVAL!!! Congratulations to longstanding Coco's Lunch artist Gabrielle MacGregor, Joshua and Étoile, who welcome baby Cato Leif into their family. Cato was born Thursday 7th July, 2016 in Melbourne and so far appears to be terribly cute and sleepy. Coco's Lunch aunties are delighted to have a new audience critic to try out their new songs and choreo on! We are so pleased to be swanning off to the Gold Coast in October to headline SINGFEST - Australia's biennial A Cappella harmony festival! From Fri 21-Sun23 October singers, choirs and vocal ensembles from all over Australia converge in Tweed Heads for a long weekend of performances, competitions, workshops, parades and celebrations. If you love singing and would like to join us - somewhere substantially warmer than Melbourne - visit our What's On page for more info. What a gorgeous day of concerts today for the Melbourne Recital Centre's Music Always program - Coco's Lunch performed at St. Marks Church for hundreds of seniors brought together by Wesley Mission, and hosted by the MRC. A joyful day interacting with the wonderful souls who made the journey from all over Melbourne. Thank you to the team including Cindy Thomas at MRC for having us!! Just announced - Coco's Lunch is thrilled to be bringing the much-loved magical seaside show I Wanna Be A Mermaid to the Melbourne Recital Centre in on Fri 23 Sept! We can't wait to dress as pirates, mermaids, sailors and other sea-inspired things, and meet all the little people who are ready to go on an oceanic vocal adventure with us!!! Please help us spread the word about this show that has sold out consecutive seasons at the Sydney Opera House, and enchanted children all over Australia and New Zealand! More info and tickets available here. Here's what Peta and Randall had to say after our latest House Concert in Melbourne! 'Wow, we were overwhelmed by how much joy and delight these five exquisite voices filled our house and hearts with. Coco's are such beautiful, warm and generous women, who share their stories and songs. Their harmonies are sublime: intricate, accurate and extraordinary. Our friends, some of whom had not heard Coco's Lunch before, were completely blown away with their performance and have not stopped raving. It was a magical night of music, exclusively for us!' More info on how to book your own Coco's Lunch House Concert. And a double whammy! Other Plans the new single has also been selected to feature on the Get Vocal 2015: The Best of Australian A Cappella compilation album, featuring the best of Aussie A Cappella for 2015!!! Thanks so much to Amelia and the team for this great honour and for supporting the work of Coco's Lunch. Really stoked to find out our new single Other Plans has been chosen to feature on the Contemporary A Cappella Society of America's 2015 compilation album Sing 12: This Big! featuring the very best A Cappella tracks from around the world!! Such a huge honour and great to know our beautiful song, written by Lisa Young, will be listened to by fans all over the globe. This morning we had the absolute pleasure of singing live on Radio National Breakfast with Fran Kelly, in a live cross from Sydney. We discussed our single launch, Lisa's study of the artform of South Indian 'konnakol' and the launch of Coco's Lunch House Concerts and Workshops - finishing with a live performance of the new single Other Plans. Thanks RN! Coco's Lunch live on 774 with Richard Stubbs!! Today we went into the ABC Southbank studios and had the pleasure of being interviewed by Richard Stubbs on his second last day at ABC! It was a privilege to be a part of Richard's show in the last hours of his time at ABC, and a thrill to sing our new single Other Plans ahead of our Melbourne launch next week. 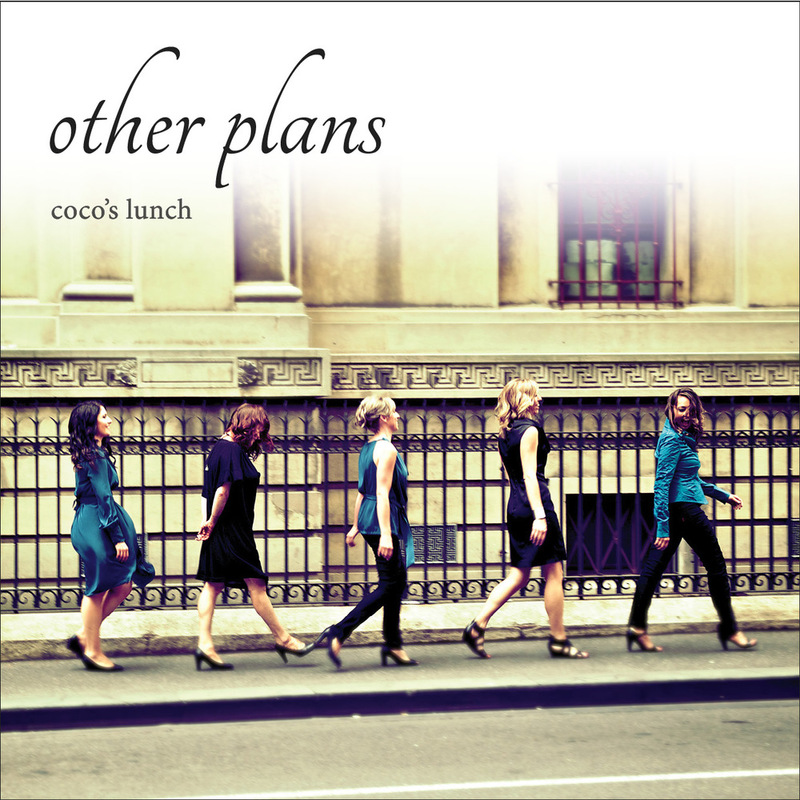 Coco's Lunch is thrilled to have won BEST SONG COMPOSED for our brand new single Other Plans, at the 2015 Australian A Cappella Awards!!! This is a wonderful affirmation of the work gone into composing this incredible song by Lisa Young, and the energy put into capturing the performance of this piece (recorded, mixed and mastered skillfully by Hadyn Buxton). Come and listen to the song, or download here. Announcing the release of our NEW SINGLE 'OTHER PLANS'!! Coco's Lunch is very excited for the world to hear our new song, composed by Coco's Lunch artist Lisa Young and featuring a feast of South Indian konnakol or vocal percussion. Lisa has just finished her PhD in the creative art of konnakol, and we can't wait for you all to hear this beautiful song! Download here or listen on YouTube. Welcome to our new website! We are proud to bring you the latest gigs, releases, news and adventure stories from our spanking new site... Please have a poke around, listen to our albums, browse our sheet music, read all about our new show Other Plans, and feel free to contact us with any enquiries about booking a Coco's Lunch for a performance, workshop, masterclass, tour, song commission or children's event. Enjoy!! Coco's Lunch has been busy working with Australian director Noel Jordan to create a new show featuring our favourite Coco's Lunch songs as well as brand new Indian konnakol flavoured pieces, composed by Coco's Lunch artist Lisa Young. We are super excited to be premiering Other Plans for the Adelaide Cabaret Festival at the Adelaide Festival Centre, where we will also be presenting our much-loved show for children I Wanna Be A Mermaid, featuring songs from the latest album of the same name.